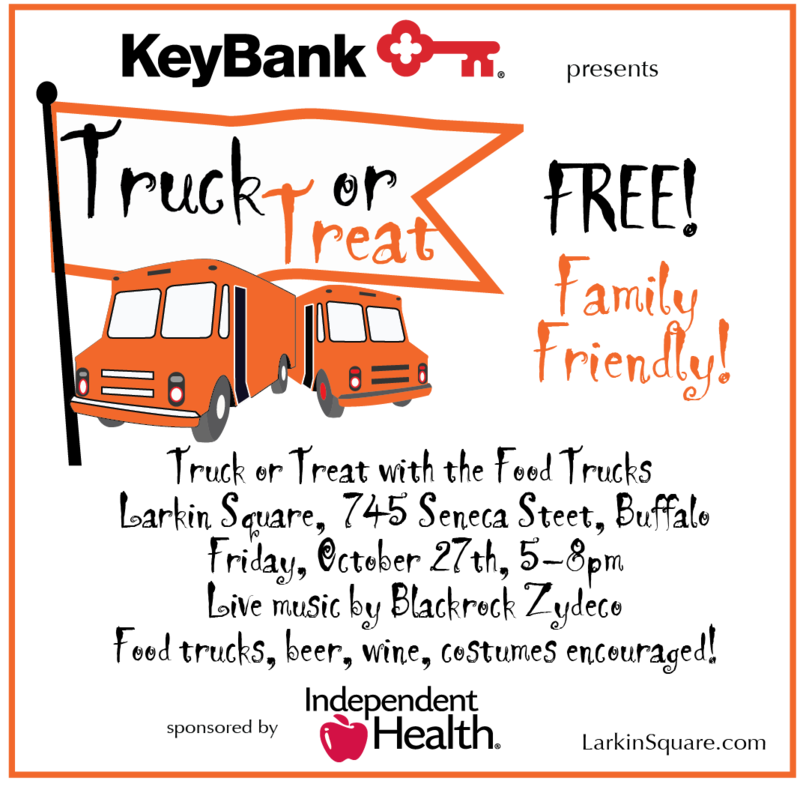 Larkin Square Truck or Treat Event is Back! 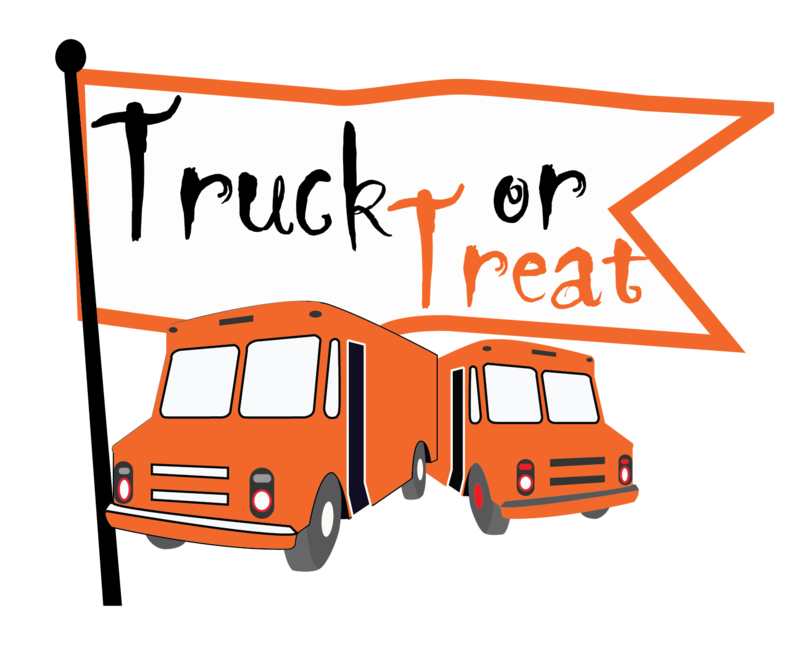 Kick off Halloween weekend with Larkin Square’s annual Truck or Treat on Friday, October 27 from 5pm – 8pm. Western New York’s favorite food trucks will fill the square with delicious eats and spooky treats! Guests can enjoy live music from Black Rock Zydeco, lawn games, craft beer, wine, pumpkin carving contests, and more. Costume are encouraged! From frightful fashions to your favorite pop star, let’s see your best Halloween costumes yet. This family-friendly event is free thanks to our presenting sponsor KeyBank and sponsor Independent Health. Free parking is located in the event lot at 111 Hydraulic Street. Handicap parking is available in a dedicated lot at Seneca and Emslie Sts. There is additional parking in the lot behind Swan Street Diner at 700 Swan Street. The 2017 season of Food Truck Tuesdays begins Tuesday, April 11th and runs through October 3rd from 5 pm – 8 pm. Thanks to the generosity of presenting sponsor KeyBank and sponsor Independent Health both parking and admission are free. We have a few parking suggestions to make your visit to Larkinville enjoyable from start to finish. Larkin Square is located at 745 Seneca Street at intersection of Seneca and Swan Streets. 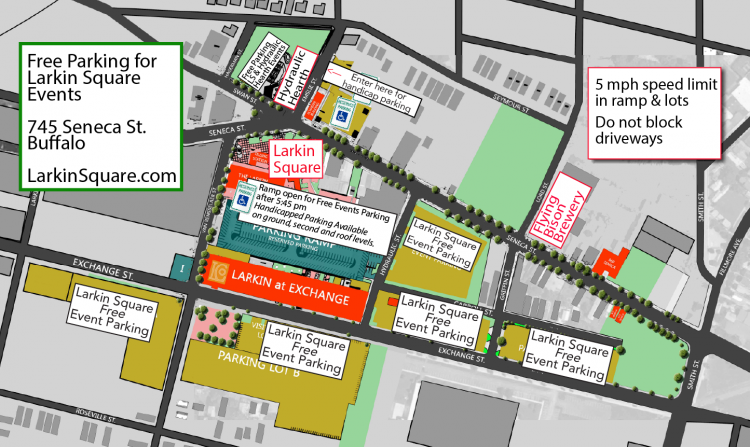 There is free parking in the Larkin Development Group lots along Exchange Street and the lot off of Hydraulic Street. The parking ramp adjacent to Larkin Square will be open for $5 premium parking starting at 5:15 pm. Drivers may access the ramp from both Van Rensselaer Street (Between Seneca and Exchange Streets) and Hydraulic Street (between Seneca and Exchange Streets). Simply walk out of the ramp into Larkin Square! We ask drivers to please not park on residential streets and park in the lots instead. Please be respectful of the neighborhood. 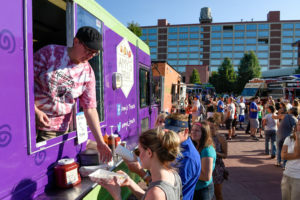 Enjoy dozens of food trucks plus live music. parked in Larkin Square plus beer and wine service. Additional trucks will be parked at Flying Bison Brewery. Guests are welcome to bring food truck purchased food into The Hydraulic Hearth Beer Garden (716 Swan St.) Flying Bison (840 Seneca St.) and BFLO Distilling Co. (860 Seneca St.). Here is a map showing the location of the Free Parking lots along with the Premium $5 ramp parking. For a roster of bands and Food Trucks, click here. Like the reappearance of robins, the sight of food trucks filling Larkin Square is one of the first signs of springtime in Buffalo. 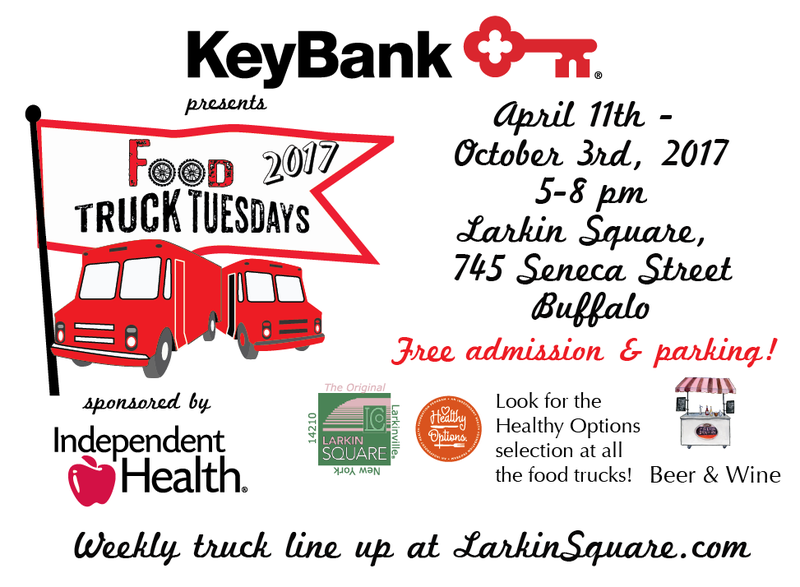 This year, “Buffalo’s biggest dinner party” will once again begin earlier than ever, as Food Truck Tuesdays return to Larkinville for another six-month season starting April 11th. Admission and parking are free thanks to the generous support of presenting sponsor KeyBank and sponsor Independent Health. 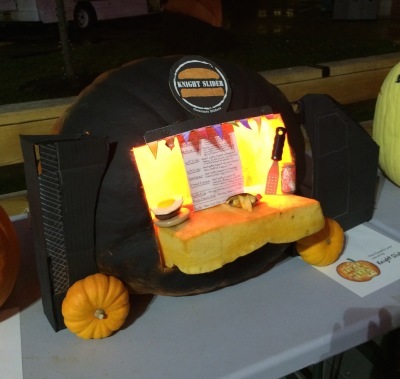 Who will become the 2015 Food Truck Pumpkin Carving Champion? Vote for your favorite pumpkin carved by the Food Trucks at Truck or Treat on Tuesday, October 27th, 5-8pm the final Food Truck Tuesday for the season. If the talent displayed at last year’s Truck or Treat is any indication, this year’s entries will be scary, creative, whimsical and fun! Guests attending Truck or Treat are invited to vote for the winning pumpkin. Knight Slider won in 2014 with many other pumpkins close contenders. The trucks will be handing out candy to the kids. Costumes encouraged as Workingman’s Dead returns to the stage to recreate the playlists of favorite Grateful Dead concerts of years past! Come for dinner and enjoy some Halloween fun! Free parking and admission. Food Truck Tuesdays Primer, including parking! The first Food Truck Tuesday of the season was very well attended. 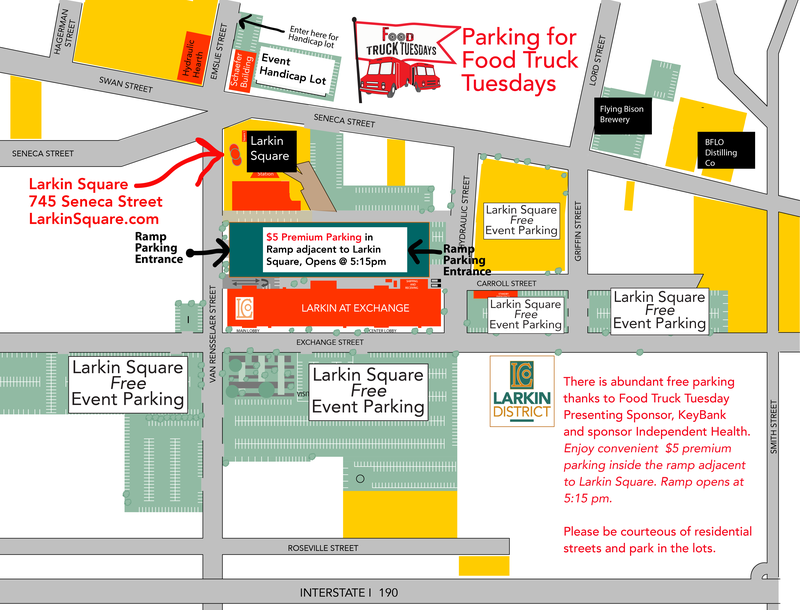 We thought it would be helpful to provide a Food Truck Tuesdays Primer, with an emphasis on “where to park?”.